This video doesn't feature all the latest enhancements and changes from this 3.8.4 release, but provides a great introduction to the Spring Tool Suite in general. The default STS distribution is now based on the recently released Eclipse Neon.3 (4.6.3) release. The latest Pivotal tc Server release 3.2.4.SR1 is now included in the STS distribution bundle. Attention: Eclipse Oxygen M6 has a severe bug that prevents the JEE, Java, and STS packages working properly. If you want to install STS into Eclipse 4.7, you need to make sure to use post-M6 builds of Eclipse Oxygen as a base. You can also download complete STS distribution packages based on early Eclipse 4.7 versions from our nightly downloads page at: https://dist.springsource.com/snapshot/STS/nightly-distributions.html. Those distribution packages already contain a fix for the bug and therefore can be used out-of-the-box. The "New Spring Starter Project" and "Import Getting Started Content" now provide a "Buildship 2.x" import strategy. For backwards compatibility the old import startegy which supports "Buildship 1.x" is also still available. Users can now specify a custom initializr service in the first page of the wizard. A new dropdown widget at the top of the page allows users to type a URL or select one from the dropdown. URLs entered in the widget will be saved in the Initializr Preference page only after the starter wizard finishes, and users can edit the URLs from there. The content of the wizard dynamically changes when a valid service URL is entered. This is particularly useful when you have your own or even multiple custom spring initilizr services running in-house. The UI for the dependencies page now features a more intuitive two-column layout. 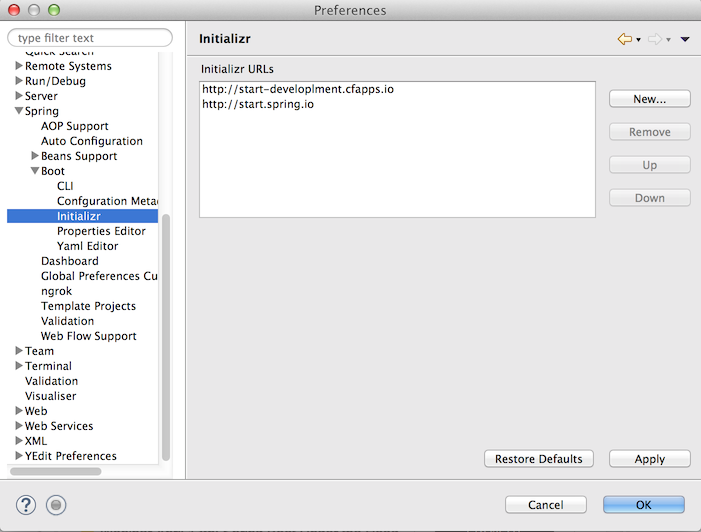 Available dependencies are shown in the left column and selected dependencies on the right. 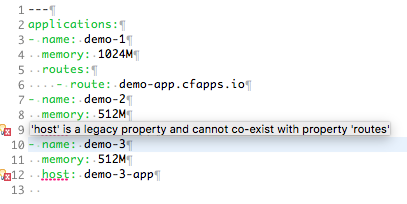 A search box at the top of the first column filters the list of available dependencies. You can easily select dependencies from the left list by checking them and remove them from the list of selected items on the right via the grey "x" in front of their name. There are also links to further documentation available for most of the spring boot starter modules. Hover with the mouse over the item and links to the relevant documentation will appear. If you edit your dependencies in the pom.xml editor that comes with Eclipse and STS, we added a shortcut to open the wizard to the list of available content-assists. That way you can easily open the wizard and add or remove spring boot starter modules to and from your pom.xml file. 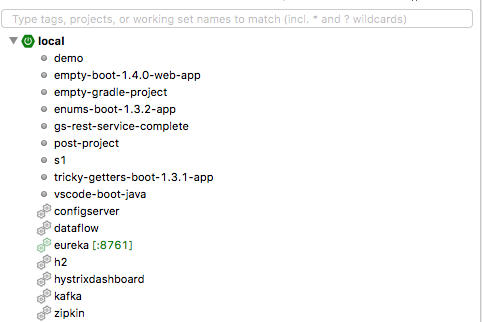 Spring Cloud CLI available services are shown in the Boot Dashboard under local run target below the Spring Boot project entries. 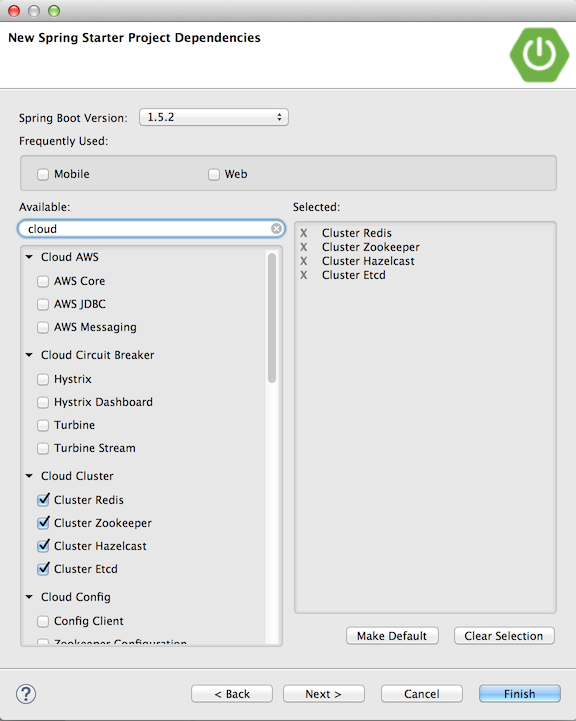 The Boot Dashboard provides the expected life cycle management control features over Cloud services provided by Spring Cloud CLI such as starting and stopping a service. 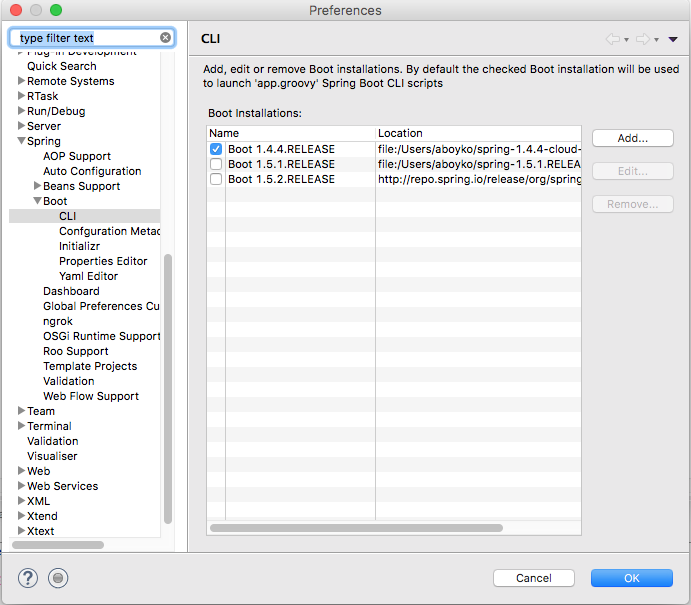 In order to see these services in the Boot Dashboard one would need to point STS to a Spring Boot CLI installation with Spring Cloud CLI installed in it via preferences Spring->Boot->CLI. Attention:The current limitation with this STS integration is that it is not aware of any Spring Cloud CLI services that you started started manually on the command line (instead of within STS). There is also an option in the dashboard view menu to disable (and hide) the local cloud services from your boot dashboard, in case you don't want to use this and don't want to spend cycles to access them. Cloud Foundry - Added support for "routes"
Users can now specify routes with paths, or TCP routes with ports if the Cloud Foundry target supports TCP. Attention: "random-route" property does not yet work with "routes", so if specifying a TCP route, an explicit port needs to be set in the route. We also added content assist and basic validation in the manifest editor. The basic validation in the manifest editor detects if legacy domain(s), host(s) or no-hostname were used with the new routes property in the same manifest and report errors appropriately. The merge dialog for deployment manifests also got support for routes. Additional paths on routes are not yet supported (known limitation). That will follow soon. Please remember that we will close those issuetrackers soon and move to GitHub issues.